Our products have been awarded Great Taste stars by the Guild of Fine Food. 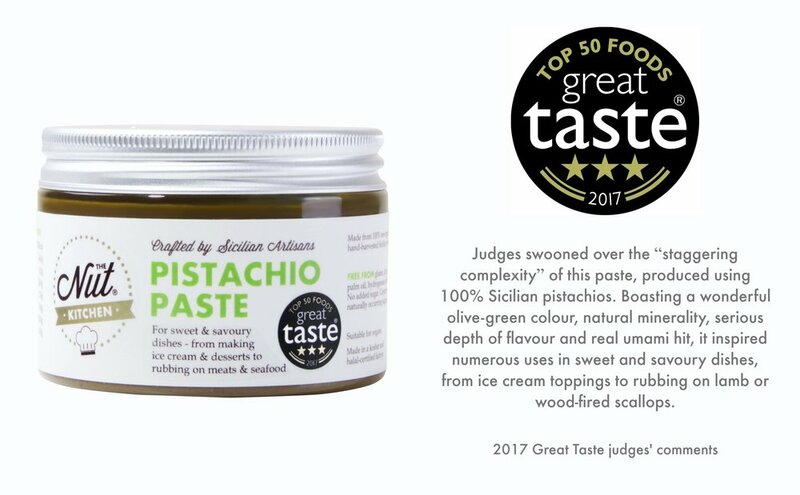 Top marks for our Pistachio Paste for achieving 3 stars and being picked as one of Top 50 Foods for 2017. It was also nominated as Best Imported Food in the Golden Fork Awards. Judges described it as "having a wonderful aroma...really deep intensity with pure fresh pistachio flavour...warm sunny layers of flavour...great, pure, natural..with an admirable show of restraint and treatment...concentrated loveliness." Not to be outdone, our Hazelnut Paste won 2 stars while our Hazelnut Spread, Gianduia Spread and Almond Spread won 1 star each. The Great Taste Awards is organised by the Guild of Fine Food and are seen as the "Oscars" of the food and drink industry. Over 400 judges from all over the world blind tasted 12,366 food and drink products this year of which only 165 were awarded 3 stars. Receiving three stars means “Exquisite. Wow! Taste That” and is the highest award given. Products with the award mean that customers are guaranteed a reliable seal of approval based on great taste and not packaging or anything else.